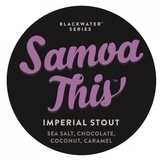 With booming notes of chocolate, caramel, and coconut, Samoa This is our interpretation of the famous seasonal treat. We’re well known for our affection for decadent, flavorful, dessert-like beers, which has put us on an endless quest to brew the ultimate indulgence. With booming notes of chocolate, caramel, and coconut, Samoa This is our interpretation of the famous seasonal treat. We went to great lengths carefully crafting each flavor, right down to the savory shortbread-like cookie base.